Friday January 13th 1899 It was a mild morning with a heavy fog. We went to town took up the butter and a turkey I had dressed for Hattie. It was after twelve before we got over home. Ott is not well today Lee seems a little better. We came home early. Did evening wash and practiced in the evening. Saturday January 14th 1899 I was busy the whole forenoon with the dinner and in the afternoon Will and I went over to Charlie Hedges to get some white [illegible] roosters. I got supper early. I read and practiced in the evening. Sunday January 15th 1899 I was busy all forenoon getting up a nice dinner Frank Stevens happened along and spent the day with us. I read and wrote in the evening. Our twin heifers two years old both had calves today six hours apart. both fine white faced calves. 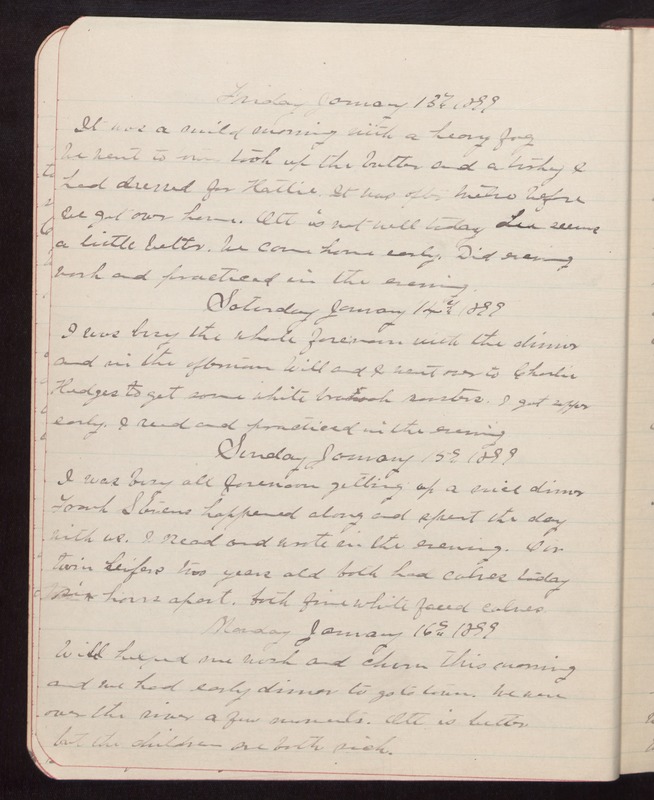 Monday January 16th 1899 Will helped me wash and churn this morning and we had early dinner to go to town. We were over the river a few moments. Ott is better but the children are both sick.